1. A water closet in a toilet room for a single occupant accessed only through a private office and not for common use or public use shall not be required to comply with 604.4. 1. Grab bars shall not be required to be installed in a toilet room for a single occupant accessed only through a private office and not for common use or public use provided that reinforcement has been installed in walls and located so as to permit the installation of grab bars complying with 604.5. 2. In residential dwelling units, grab bars shall not be required to be installed in toilet or bathrooms provided that reinforcement has been installed in walls and located so as to permit the installation of grab bars complying with 604.5. 1. The rear grab bar shall be permitted to be 24 inches (610 mm) long minimum, centered on the water closet, where wall space does not permit a length of 36 inches (915 mm) minimum due to the location of a recessed fixture adjacent to the water closet. 1. A lavatory in a toilet or bathing facility for a single occupant accessed only through a private office and not for common use or public use shall not be required to comply with 606.3. 606.4 Faucets. Controls for faucets shall comply with 309. Hand-operated metering faucets shall remain open for 10 seconds minimum. 1. Grab bars shall not be required to be installed in a bathtub located in a bathing facility for a single occupant accessed only through a private office and not for common use or public use provided that reinforcement has been installed in walls and located so as to permit the installation of grab bars complying with 607.4. 2. In residential dwelling units, grab bars shall not be required to be installed in bathtubs located in bathing facilities provided that reinforcement has been installed in walls and located so as to permit the installation of grab bars complying with 607.4. 607.6 Shower Spray Unit and Water. A shower spray unit with a hose 59 inches (1500 mm) long minimum that can be used both as a fixed-position shower head and as a hand-held shower shall be provided. The shower spray unit shall have an on/off control with a non-positive shut-off. If an adjustable-height shower head on a vertical bar is used, the bar shall be installed so as not to obstruct the use of grab bars. Bathtub shower spray units shall deliver water that is 120 F (49 C) maximum. 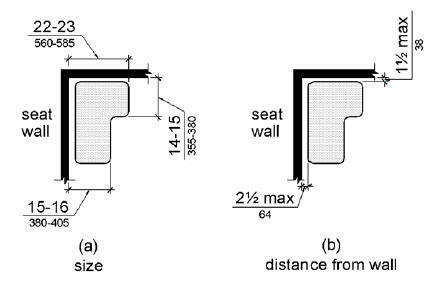 EXCEPTION: In residential dwelling units, seats shall not be required in transfer type shower compartments provided that reinforcement has been installed in walls so as to permit the installation of seats complying with 608.4. Advisory 608.5.2 Standard Roll-in Type Shower Compartments. In standard roll-in type showers without seats, the shower head and operable parts can be located on any of the three walls of the shower without adversely affecting accessibility. 608.6 Shower Spray Unit and Water. A shower spray unit with a hose 59 inches (1500 mm) long minimum that can be used both as a fixed-position shower head and as a hand-held shower shall be provided. The shower spray unit shall have an on/off control with a non-positive shut-off. If an adjustable-height shower head on a vertical bar is used, the bar shall be installed so as not to obstruct the use of grab bars. Shower spray units shall deliver water that is 120 F (49 C) maximum.